With the frigid temperatures and Wind Chill Warning that will start this evening through Thursday afternoon, I wanted to make sure that everyone had the latest information from the City. Below is the press release that was sent out today for the Press Conference that took place at Indy Park’s Municipal Gardens (see picture). Although this does not affect most of our district, trash service will be cancelled on Wednesday and Thursday this week. Normal trash will resume on Friday. Please see the attached to learn more if you are affected. A lot of important information is below, including information about pets. I have attached some safety tips from the Office of Public Health and Safety. Also attached is information about Indy Parks Winter and Spring hours, as mentioned in this press release. Remember to listen to the news about closings or delays that schools may have tomorrow and Thursday. I want to encourage everyone to be especially careful during this time. Do not be outside for any length of time, as it does not take long for frostbite to set in. If you do not need to be out and about – stay at home or at work. Don’t let children play outside. Remember to keep pets inside. If there are elderly, neighbors, or family members that may need some extra attention, please check on them and make sure they are okay and are not in need of anything. Remember, too, that pipes can freeze. Make sure you leave cabinet doors under sinks open so they get the warm air from the house. With the low temperatures expected I plan on leaving a small stream of water on with my faucets that are on an outside wall or close to the attic where it also gets very cold. You don’t want to experience frozen pipes! INDIANAPOLIS – The National Weather Service has issued a Wind Chill Warning for Indianapolis that will be in effect from 10 pm tonight until 1 pm Thursday, as well as a Wind Chill Advisory from 1 am Wednesday through 1 pm Thursday, with wind chills expected to reach as low as -20 to -40F. In response to these expected dangerously cold conditions, public safety agencies, City departments, and community service providers are teaming up to provide warm shelter as well as critical services and resources to Indianapolis residents. IMPD’s Homeland Security Bureau will activate the Emergency Operations Center (EOC) at 4pm to monitor conditions. The EOC will remain activated until at least Thursday afternoon. The EOC convenes public safety, health, and service agencies to monitor and provide a coordinated response to emergency and significant weather incidents. The EOC will remain in close communication with area hospitals as well as community service providers and homeless shelters. The City will open a community warming center at Indy Parks’ Municipal Gardens, 1831 Lafayette Road, at 10 am tomorrow. This facility will remain open until 9 pm on Thursday. 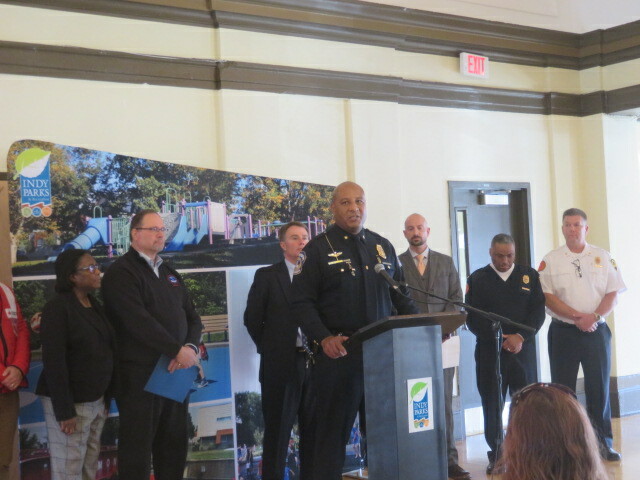 IMPD’s Homeless Unit has begun outreach to individuals experiencing homelessness to connect them with warm shelter and resources in addition to 12 outreach teams that will canvass the city tomorrow night from 6 – 11 pm. An overflow shelter for residents experiencing homelessness will be opened if needed. Residents in need of warm shelter are encouraged to call Connect2Help 2-1-1, and can utilize Indy Parks facilities, malls, and Indy Public Libraries during normal business hours. The Indy Parks facility schedule is attached, and the Indy Public Library schedule can be found here. It is important to remember that frostbite can happen in just a few minutes during this weather event. Indianapolis EMS (IEMS) recommends that residents remain indoors and stay dry. For those who absolutely must go outside, wear multiple layers of loose fitting and lightweight clothing in addition to a water-repellent and hooded outer garment. Wear a head covering, cover your mouth, and wear gloves or mittens that are well secured at the wrist. These temperatures are considered very dangerous, and children playing outside should be minimized. It is against city-county ordinance (Sec. 531-401) to leave animals outside when the temperatures are at or below 20 degrees Fahrenheit, OR, if a wind chill advisory has been issued for the city. Indianapolis Animal Care Services (IACS) urges all pet owners to take extra precautions during the extreme cold to keep their four-legged friends safe. Residents could face fines up to $200 for failing to properly care for pets in cold weather. Residents who are concerned about the safety of an animal in their neighborhood are asked to call the Mayor’s Action Center at 317-327-4622. For after-hour emergencies, please call 317-327-3811. Residents who need help making their home safer for a pet in cold weather can contact Friends of Indianapolis Dogs Outside (FIDO) at 317-221-1314. Volunteers with FIDO will continue to assist IACS in responding to calls involving animals left out in the cold, so that we can make sure every animal in Marion County is safe. Indianapolis area school districts are keeping a close watch on the expected health impacts of tomorrow’s sub-zero temperatures and wind chills. Residents are encouraged to check local news outlets for any closings and delays to be announced. The Office of Public Health and Safety offers the attached safety tips for residents. Attached: Indy Parks facility schedule, safety tips from OPHS. that will start this evening through Thursday afternoon, I wanted to make sure that everyone had the latest information from the City. Below is the press release that was sent out today for the Press Conference that took place at Indy Park’s Municipal Gardens (see picture).